When it comes to Thursday Night Soup, I like to cook by the seat of my pants. I have no problem, for example, dumping all of my leftover Chinese take-out into one pot with enough chicken broth to cover and calling that dinner. If you are nervous about leaving any meal up to chance, you can use the ingredient calculators on websites like Recipe Matcher, My Fridge Food, and Super Cook to get hundreds of suggested recipes that use ingredients you already have on hand. The great thing about Thursday Night Soup is that it can be tailored to fit any cultural taste or diet restriction. Depending on how you eat during the week, your Thursday Night Soup could be a one-of-a-kind eating event or the exact same recipe over and over. In the Northern Hemisphere, the winter holidays are the perfect time to start your Thursday Night Soup routine. In addition to winter being “soup weather,” Thanksgiving, Hanukkah, and Christmas all provide abundant leftovers for soups starting with homemade stocks made from the Thanksgiving turkey carcass or the Christmas hambone. Leftover stuffing, mashed potatoes, gravy, and even cranberry sauce can be mixed together into a flavorful winter stew. Most of my Thursday Night Soups start with homemade meat or vegetable stock. Sometimes my Thursday Night Soup is as simple as adding raw eggs and green onions to chicken broth to make egg drop soup, and some weeks it’s an elaborate gumbo that contains 10 different kinds of meat and seafood. I pull all the leftovers out of the refrigerator so I can assess what I’m dealing with. 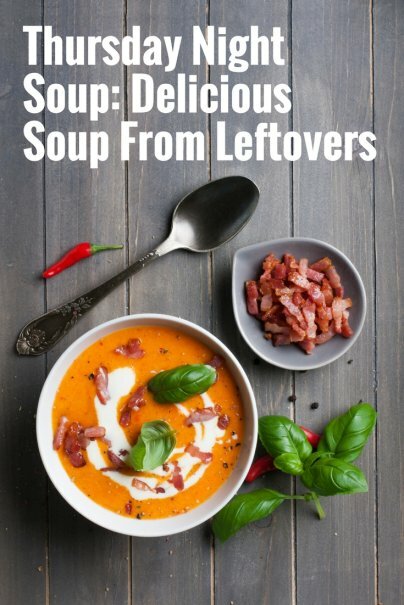 Leftover cooked pasta (with or without sauce), meats, cooked beans, and cooked veggies are all prime candidates for soup. While I’m digging around in my fridge, I also take the opportunity to go through my raw vegetables to find out what’s on the verge of becoming compost, and I look at the sell-by dates on all my dairy. If I don’t have enough leftovers to make a filling soup, I stretch things it by adding rice, pearl barley, or noodles from my pantry. I chop the meat into small bits and add them to my big soup pot with some homemade stock. While the meat and the stock are heating up, I sauté any raw vegetables with some onions and garlic in some butter, oil, or bacon grease to bring out their flavors. I try to add hard ingredients like carrots to the soup before I add softer ingredients like tomatoes to keep stuff from getting too mushy. I add fresh herbs to the soup about 15 minutes before serving. I add pre-cooked pasta last to keep it from completely breaking down into mush from overcooking. I top the soup with herbs, bacon, nuts, seeds, or cheese just prior to serving. Stale bread or crackers can be toasted into croutons as garnish. Sometimes I take a cue from French onion soup and top each bowl of soup with a round of toasted cheese bread. If my cooked ingredient gets too mushy in the soup making process, I just puree the cooked soup. (I like using stick immersion blender for this because I can puree everything in the pot, but you can use a food processor or blender for this, too). If my soup is too thin, potatoes (baked, roasted, or mashed), cooked rice, and cooked cauliflower are all good thickeners for soups. Yummly has a nice variety of soups from corn chowder to lemony avgolemono that all use leftover rice. When assessing your leftovers, don’t forget to look outside your fridge. Stale bread, wine, flat beer, and even fruit can all be the basis of delicious soups. The main ingredient in Ribollita, the classic Tuscan soup, is stale bread. Wine soup is another old-fashioned Tuscan bean soup recipe that is flavored with red wine and 20 cloves of garlic. White wine soup is a creamy onion soup. Cheese is a pricey ingredient that is rarely leftover in my kitchen. However, the hard rind of Parmesan cheese is the secret ingredient in many soups. The rind works well in any soup that would taste good with Parmesan sprinkled on top. I store my old cheese rinds in the freezer. Not all every Thursday Night Soup needs to be served hot. Spaniards use up all their squishy tomatoes and wilty vegetables by turning them into gazpacho, a savory cold soup that requires no cooking and is a refreshing alternative to a salad. I’ve actually had great success at parties with gazpacho popsicles. Traditional Andalusian recipes for gazpacho often use stale bread to give the vegetarian soup more body. Amy Dacyczyn, author of The Tightwad Gazette, saves leftover bits of meat, vegetables, sauces, dips, salad dressing, and even other soups in her Perpetual Soup Container (a five pound peanut butter bucket that she stores in the freezer). When the bucket is full, she crosses her fingers, thaws everything out, and cooks it. If the leftovers don’t yield enough broth, she adds bouillon and water to make up the difference. According to Amy, you can make almost any casserole or pot pie into a soup by adding liquid, and turn any soup into a casserole or pot pie filling by removing liquid. Amy has a much higher tolerance for eating terrible food for the sake of saving money (see her breadcrumb cookie recipe) than I do, but I have to hand it to her — this Russian Roulette version of soup preparation often yields surprisingly delicious results. If you don’t have enough leftovers to make a substantial soup by yourself, then join forces with your neighbors and have a Stone Soup party, where each person brings their leftovers to turn into a one pot, pot-luck (one-potluck) meal. What’s in your favorite Thursday Night Soup? Great article. I've done something like this with my crock pot when I've had a lot of leftovers, adding grains or beans as needed. A sauteed onion and garlic helps ensure a tasty broth. Although we may not all get paid on Friday anymore, most of us probably do our major food shopping for the week on Saturday or Sunday, so Thursday night is still a good time to use up leftovers! Another great thing about making soup is you can always freeze any excess for later eating. I threw together a "winter soup" out of leftover roasted squash, sweet potatoes a basic mirepoix and homemade veggie stock. I ate it day of with some leftover greens and froze half for later use. I ended up reducing the other half into puree for a roasted chicken. I find (as a single gal) that keeping it basic makes it more versatile. Awesome article!